By buying this product you can collect up to 4590 bonuspoints. Silovagn kds 54 typ DB, vädrad, längd över buffertar 26,5 cm, epok III. Model: The car's main frame is constructed of metal. The buffer sheathing, grab irons, and handrails are constructed of brass. The car superstructure and numerous separately applied parts are made of high quality plastic. The car is weathered realistically. The minimum radius for operation is 600 mm / 23-5/8'. Length over the buffers 26.5 cm / 10-7/16'. 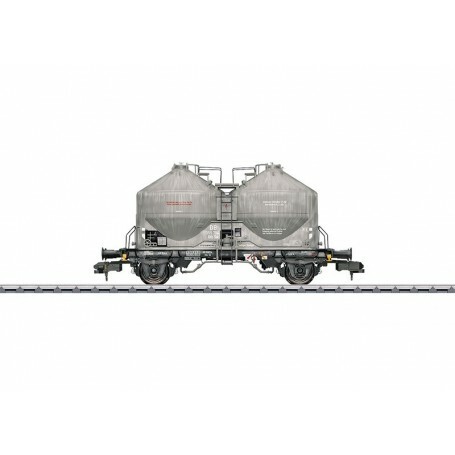 Prototype: German Federal Railroad (DB) type Kds 54 powder freight silo car with compressed air unloading. Former type Ucs 908.